Everyone loves prosperity, but in Georgia’s East Central region, prosperity can also pose challenges – like having more jobs than people. To meet the job requirements of new and expanding industries, counties have been forced to move quickly to mobilize workforces. That’s led to a number of innovative workforce initiatives by local and state economic planners. Building a viable workforce is a team effort involving many players. Industries, economic development authorities, regional groups, private recruiters and the state government all play a part. Typically, when a company moves into a county, they hire private recruiters to help find a workforce. For example, Georgia-Pacific is building a $135-million softwood lumber processing plant in Warren County. The Atlanta-based manufacturer worked with the GDOL to mobilize the skilled workforce they needed. The expansion will add 30 to 40 jobs up front. The GDOL is also working with Starbucks on workforce mobilization for its Augusta Soluble Plant. The Seattle coffee company is in the process of building a $120-million expansion that will nearly double the facility’s footprint and create at least 100 new jobs in Richmond County. These collaborations underscore a key theme in East Central’s workforce development – that it takes a region to find a workforce. All too often, the required workforce is not immediately available within the county. The reason may be linked to lack of a certain skill set or raw population numbers. Some counties are adding population at a record pace, while others are declining in numbers. For example, there’s Columbia County, ranked by the U.S. Census Bureau as one of the nation’s fastest-growing counties. Candler, Bulloch and Washington counties are also showing population uptrends. On the other hand, the region includes Hancock, Warren and Taliaferro counties, which have had declining population trends for many decades. In the case of Taliaferro, it also has the state’s smallest population (1,628 as of 2017). But tiny Taliaferro County is the site of one of the region’s biggest deals. Harrison Poultry Inc. is constructing a $72-million feed mill and hatchery in the county. The north Georgia poultry processor expects the 300-acre facility to create 200 jobs and open in 2020. One thing you don’t hear much about in these parts is the bedroom community, which is a residential area that lacks job opportunities, thereby forcing residents to work in other counties. One example is Lincoln County, where 73 percent of its residents leave the county to work, according to John Stone, director of its development authority. However, that statistic may soon be improving. Michigan-based Apex Marine Inc. is expanding in Lincoln County with a boat manufacturing facility that is expected to create 40 to 50 jobs. South Georgia Equipment, a farm equipment manufacturer, is also coming to Lincoln County; that facility promises 50 to 75 jobs in the first year and up to 250 within five years. But while economic officials welcome new business opportunities to their counties, it’s not the only way to put people to work. “I’m not focused on the bedroom community issue, but in working with our neighboring counties on a regional basis,” says Robert Bennett, executive director of Columbia County’s Development Authority. He notes that some 75 percent of Columbia County’s residents work outside the county. When a multi-county area is taken into account, companies in Columbia County could potentially have access to a labor shed of up to 400,000 people, Bennett says, even though the county population is only 147,450. Richmond County, which sits on the South Carolina line, is collaborating with that state’s Aiken County on workforce issues, according to Cal Wray, president of the Augusta Development Authority. Many residents live in one state and work in the other. A major study is underway to examine how counties can tap the potential of this two-state regional labor market. More people will be coming to Augusta soon thanks to the $100-million Georgia Cyber Center. The first building at the center opened last summer, with a second one opening its doors last January. The center is the single largest investment in a cybersecurity facility by a state government. The cybersecurity sector is growing fast, and there are not enough people to fill the needed jobs – an estimated 500,000 unfilled jobs by 2021. 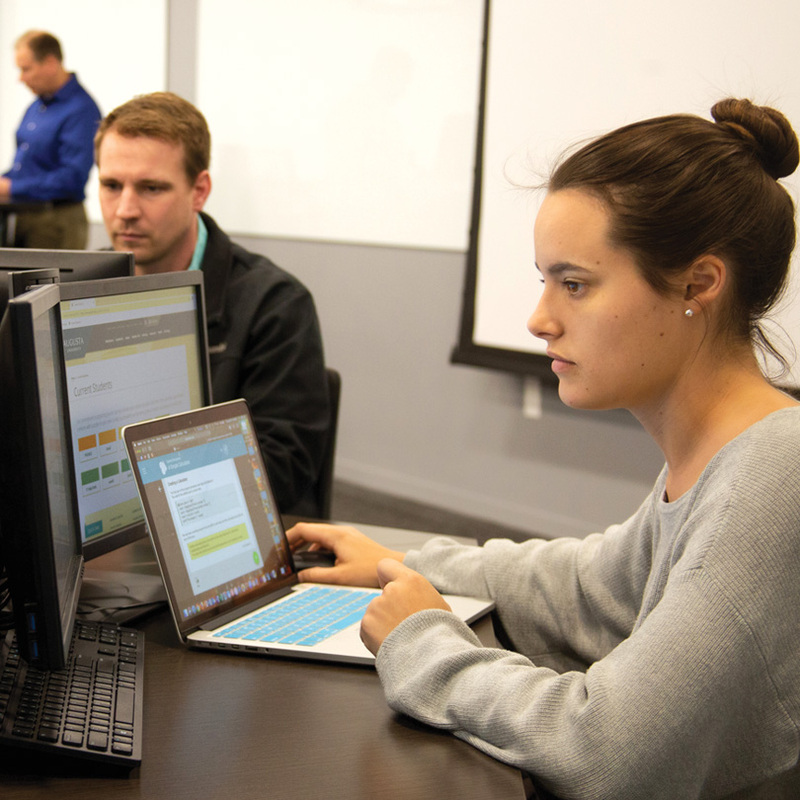 The Georgia Cyber Center aims to train the next generation of professionals to help fill those positions while also supporting private industry companies that are developing new technologies. Soft skills include teamwork, punctuality, communication skills, a positive attitude and a willingness to learn. Washington County has a strategic plan to tackle the issue. Called the “Golden Five” program – a reference to the five major soft skills – the initiative is a collaboration of Washington County’s schools, industry leaders and community economic planners to increase the employability of its workforce. Other counties in the region are also addressing the issue. “We are in the process of creating a career academy that will uniquely partner with industry to tailor curriculum and student internships [so that we] have 100 percent of graduates career-ready,” says Bubba Longgrear, superintendent of the Candler County School District, noting that the academy is slated to open in July. Jefferson County also has a work-based learning program where high schools can work with local industries to tailor training to business needs. The program aims to address the lack of skilled workers to fill the available jobs. “Our unemployment rate is at a record low. There are more jobs than people,” says Greg Sellars, executive director of the Jefferson County Development Authority. Lincoln County has a dual enrollment program that allows high school students to take college courses, thereby accelerating education and getting youth into the workforce sooner. The education/business initiatives are part of Lincoln County’s push to ensure workers are trained for a new economy that’s facing heightened global competition. “We are trying to bring in new jobs that are not as vulnerable to global trends,” says Stone. Whether it’s high-tech cybersecurity or traditional manufacturing, the East Central region is working together to make it happen. The lifelong public schools educator has been a pivotal figure in bringing educators and industry leaders together at the planning table. Longgrear, a former football coach, is in his fourth year as superintendent of Candler’s school system. He says his goal is to ensure that students have the soft skills needed to thrive in their careers. Before coming to Sandersville in 2017, the Columbus native worked in Harris County, where he served as president of its chamber of commerce. As development authority director, he’s a vital link in the workforce development chain, partnering with the school board and industry to mobilize a career-ready workforce. • Georgia-Pacific is investing $135 million in a softwood lumber production facility expansion that will bring a net 40 new jobs to Warren County. • In Washington County, Premier Tire Distributors Inc. is starting up a $1.5-million manufacturing operation that will add 30 new jobs. • Golf cart and utility vehicle manufacturer Club Car is opening a $36-million, 550,000-square-foot distribution center in Columbia County. • In Statesboro, the $20-million Creek on the Blue Mile is transforming a drainage canal into a linear park and development, generating up to 750 jobs. A 25-acre lake will also be created to alleviate flooding, control runoff and provide a city reservoir.